Angst Over Avenue Art | News and Features | Style Weekly - Richmond, VA local news, arts, and events. With Easter Parade coming, Art 180 told to remove art exhibit from Monument Avenue. 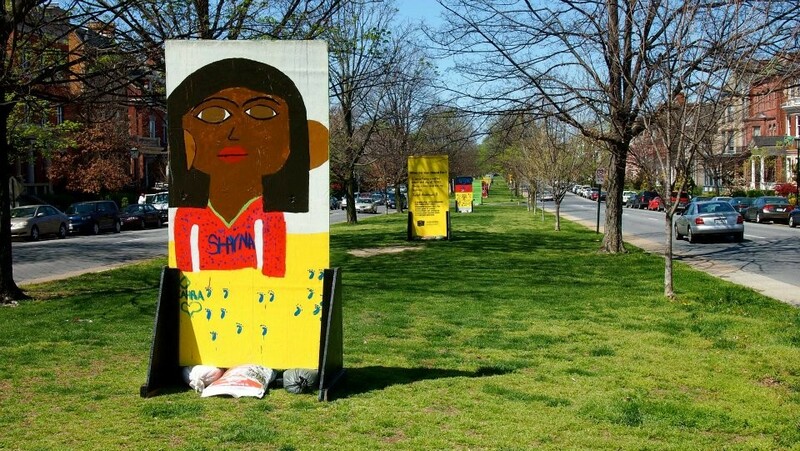 Art 180 has been ordered to remove its art installation on Monument Avenue. It didn’t take long for the Monument Avenue boo birds to come out. Just days after Art 180’s roving exhibit, entitled “What Do You Stand For,” made its way to the Grand Avenue on March 26, the nonprofit’s executive director was getting calls from the city’s Department of Public Works. The 8-foot-tall displays had to come down. At this point, it’s not so much the nature of the art work -- there’s one piece that features a woman's body, wrapped in what appears to be a rainbow, but otherwise it’s fairly tame -- but more about, well, timing and location. There are 31 pieces in the exhibit, 25 of which are the work of fifth- and sixth-graders in the city. Originally, Paul says the group was granted a permit to display the art work until early May. Art 180 also received the blessing of the Monument Avenue Preservation Society in September, Paul says. Tammy Hawley, press secretary to Mayor Dwight Jones, says in a statement that the Jones administration wasn’t aware that the Department of Public Works had revoked the permit until Saturday evening. Chief Administrative Officer “Byron Marshall has the matter under review and is expecting to have a resolution by tomorrow,” Hawley says in the statement. City Councilman Charles Samuels, whose district includes Monument Avenue, says in a statement this afternoon that he’s concerned about the artwork conflicting with the Easter Parade next Sunday. Paul says that won’t be a problem. Art 180 has agreed to move any of the exhibits that would be an obstruction during the Easter Parade. And the group appears to be gaining support, with residents along the avenue already asking about displaying the art work in their front yards if the city revokes the permit later this week.